This week’s post will cover three main areas of our work: the Issue no. 58 of our bilingual newsletter FACS, our fundraising campaign regarding Gifts of Peace and the 6th Issue of Consume to Reduce Poverty. The lead content or question of this week’s post is how can we continue to help in reducing poverty when free market-based economies go in transition, with a particular case of the UK exiting the European Union? The answer to this question can be found in the 58th Issue of FACS which is out now. We have provided below the key summaries about the issue. Besides the above lead story of the week, we would like to remind you that our Gifts of Peace Campaign continues and will end on the 31st of January 2018. The January month of Responsible Consumption together with our advocacy against consumption-based poverty continues as well. Likewise, our Consume to Reduce Poverty (CRP) project is still available to support poor children, young people and families who are poor by consumption (i.e. whose consumption is below the defined threshold). The resource relating to this CRP is also available. As we said it last week, the focus of this year’s CRP issue is on Online Shopping and Buying – Tips and Hints. As part of the engagement to this focused theme, we encourage participants to the CRP to exchange their shopping and buying experience through social media networks in order to help reduce consumption-based poverty. 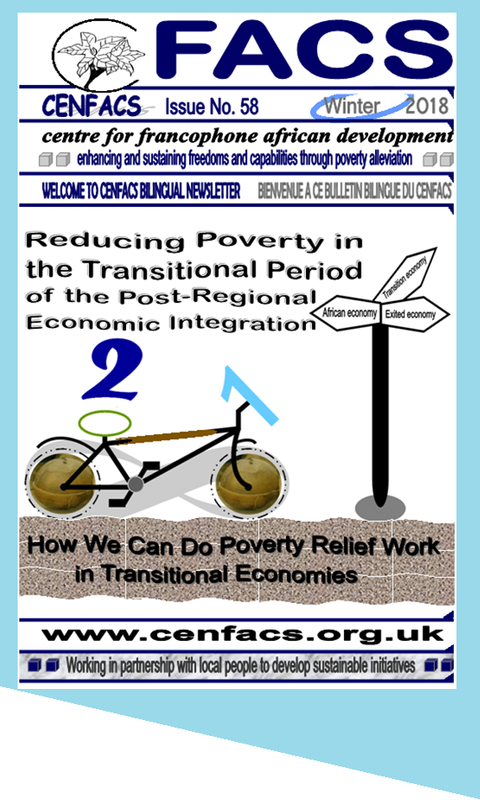 For support on consumption-based model of poverty and to access CRP contact CENFACS. We have already provided the abstract of this issue two weeks ago. Below are the key summaries making the contents of this issue. Transitional economy or transition economy was applied to the Eastern and Central European economies in the late 1990s when they moved from centralised or planning economy to a market-oriented economy. It was when the Soviet Union communist bloc collapsed in 1991 and was then seen as a transition from planned economy or state controlled economy to a market-based one. The concept of economic transition can be extended today to include various types of economies. Before extending it, we are going to define it. We will then establish its links with both exited and regional economies, democracy, market orientation and third sector players. By doing some theory thinking, we can extend this definition to other types of economy. To do that we can make the following working hypothesis. If an economy changes its ties regarding its international economic relations or de-link itself from its international mode of functioning after being engaged in a particular economic area for a long period (for example 20 years or more of trend), this economy may need undergoing some forms of transition in order to keep its equilibrium and avoid major functional upsets. Depending on the influence of this economy on the bloc or area, the latter may or may not need a transition or some adjustments as well. From the above perspective and assumption, a transition economy or transitional economy is also an economy which is changing from an integrated economy within a regional economic bloc to an economy that is exiting (exited) from the bloc. Transiting from a regional economic bloc to an exited economy can be soft or smooth or even hard landing depending on what countries involved want. The exited economy may require legal and institutional reforms, a new social safety net, new trade relations, macroeconomic stabilization, monetary support and economic restructuring and reforms at various levels (micro, miso and macro levels). This is why a transitional period for an exited economy may be needed. As said above, there could be transition for both the leavers and the rest of the bloc. In which case, we can speak about transition of the economy of the bloc and of the leaving country. It means that both economies may need a preparatory period to minimise or nullify adverse effects and impacts of the exit from the bloc. Economic transition can open up a process of social transformation and a new wave of change. There are various models of social transformation which include: a revolutionary model (like in the case of the Eastern and Central European model of the 1990s), an evolutionary model (such as a Chinese model), a gradualist model etc. Because society is never static as said Scott and Marshall (2), economic transitions or shifts can lead to social change (i.e. the outcome of a struggle for advantage between different competing groups as defined by Conflict theories). Economic transition can produce a structured process leading itself to a specific direction or tendency in society (pp. 72 &73). If this exited economy comes from a regional economy with market-based institutions, it may still be a market-based one. But, as it will no longer be part of a regional economic bloc, regional institutions may no longer apply to the exited economy. Although we spoke about the Soviet bloc, there is no comparison with other economic blocs (e.g. the European Union) which are mostly based on democratic principles and the free will of each country to join or stay in or even leave the bloc. The Soviet bloc was based on force. Every things remaining equal, the EU is a successful story in the theory of regional economic integration in terms of poverty reduction and free movement of people and markets. The exiting UK remains a special case of exit in the history of regional economic integration. The business of poverty reduction may be reshaped by those involved in it as economies are in a transitional phase. In those involved in poverty reduction; there are voluntary, non-governmental, third sector and community organisations. They may find it useful to have transitional plans, programmes and strategies or put it simply a plan A, B or C to deal with the effects of economic transition. In order to take into account this new economic landscape, CENFACS is integrating transitional economy and the Post-REI (Regional Economic Integration) into its revised version of the Twenty-tens Programme. This integration will apply as we move along with economic transition. In other words, most of the projects designed for the Twenty-tens will be dotted with transitional economy. To sum up, we can do some theory thinking regarding economic transition and extend it to the reality of exited and regional economies. Likewise, we can look at how this theory and its practice relate to the life of third sector and define the new frontiers of poverty reduction. Its application on CENFACS pushes us to redefine, rethink and adjust the way we do poverty relief and development work both in the UK and Africa. When a country decides to withdraw its membership from a particular organisation such a regional economic bloc, it is always expected from the two sides, the leavers and those remaining in the organisation, to clarify their terms and conditions of separation. This expectation comes from all the economic actors (i.e. the public, the private, public and the voluntary sectors). Sometimes, it may require setting up transitional institutions to deal with transition. For example, in the case of the economic transition of Eastern and Central European Countries a European Bank for Reconstruction and Development was set up. We would not recommend a new bank for every case of economic transition. The voluntary and charitable sector them too expect clarification in the local and international development strategies. This clarification is required so that they know HOW THEY CAN DO POVERTY RELIEF WORK WHEN ECONOMIES ARE IN TRANSITION like in the case of the exit of the UK from the European Union. Beyond these expectations, the responsibility of making transition work for the voluntary sector lies not only on the enabling institutions of the economic transition; but also on what each organisation can do to make transition works for them. Regarding CENFACS, some elements of our strategy and thinking can be found in the previous work we did on this issue. As a UK-based charity, economic transition, if any, may or may not affect us as it may do for others in the voluntary and charitable sector. However, the effects of economic transition should not be conceived as one size fits all. Funding: as we are no longer recipient of the European Social Fund, transitional change in the grant making process may not affect us. Volunteer recruitment: it is now almost ten years that we have not been able to recruit volunteers from continental Europe. Project beneficiaries: as we work in partnership with local people to develop sustainable initiatives, most of our users (both indirect and end users) are local in the UK and Africa. Overseas representation agency: we do not possess any overseas office in the continental Europe. We are UK-based and work with Africa-based organisations. International financial transaction: because of our size, we do not manage a large amount of foreign exchange currency or international money transfer through the EU. Research and development: we do our own independent research with a very limited budget. Travel: we are local and if it happens that we need to visit overseas projects, our supporters can do it for us. To continue to do our poverty relief work in transitional economies, we need take into account the above factors as well as integrate transitional economy into our strategy, programmes and projects. Having a very little reliance on others puts us in a position to make economic transition to work for us. Briefly, to well play the game of economic transition the rules of game have to be fair and transparent and communicated to all players. We hope that economic transition will come with new opportunities so that we can continue our work on poverty reduction. We can only fully speak about the effects of economic transition when it has occurred and completed. However, during the transitional period, there could be some effects although we may be in the assumption of the rules of REI (Regional Economic Transition) would continue to apply until the end of economic transition. Also, to speak about transition, we need to identify what the REI (e.g. European Union) has been providing to the voluntary and charity organisations both directly and indirectly. Briefly speaking, there is a number of benefits such as funding opportunity (through the European Social Funds, ERAMUS programme and other funding programmes), labour (volunteers, workers and other supporters), the economic scale of the big European Union (EU) market etc. These benefits can be added with the general attributes of any regional economic integration such as the general free movements of labour, capital, goods and services. It has to be emphasised that the virtue of big market of the REI has a good feeling factor. This can add an effect on the way we do development and poverty relief works. Until a country effectively leaves a given REI (like the EU), these benefits may still exist unless there is an alternative arrangement. The feel good factor may increase or decrease depending on the assurance from the decision making bodies of economic transition. Although it is premature to speak about the effects of economic transition of REI, there is no doubt CENFACS may benefit from the good feeling factor and the enabling institutions gearing to support the voluntary and charity organisations during the economic transition of REI. At the end of economic transition, we will then do impact analysis of economic transition in terms of its effectiveness and outcomes on us. Some of you may be aware that CENFACS work in partnership with local people to develop sustainable initiatives. Most of the initiatives we try to develop both in the UK and Africa are to do with sustainable development and poverty reduction. Some of you know as well, the Regional Economic bloc like the European Union (EU) has got good policies on the environment. Also, most of the EU member States adhere to the principles of the International Climate Treaty on Climate Change (the Paris Climate Treaty). Likewise, the majority of the EU countries including the UK agree on the United Nations Sustainable Development Goals and Agenda 2030. At the level of EU and African Union cooperation, there are areas of sustainable development that are covered. Sustainable development will continue to be an ever growing area of interest and a driver in international development. Organisations involved in the work about sustainable development will continue their work. CENFACS’ work on sustainable development will still continue in the transitional period and beyond. Quand un pays membre d’un ensemble économique régional décide de quitter l’ensemble ou le bloc économique, il peut y avoir plusieurs scénarios pour exécuter cette sortie. La manière la plus prudente de s’y engager est de concevoir une période de transition entre l’économie sortante et l’économie régionale restante. Elles peuvent s’entendre d’avoir une transition économique. La transition économique peut avoir des formes ou modèles variés (transition soit totale, soit partielle, soit encore sélective). Quelque soit le modèle choisi par les parties en présence, il serait mieux que ce modèle soit aussi compatible avec les besoins et demandes des operateurs et acteurs économiques, particulièrement et non exclusivement avec ceux du secteur associatif. Ceci est important pour éviter des crises de gestion de transition sans parler d’autres types de crise. Le secteur associatif est un des secteurs qui s’occupent des activités de réduction de pauvreté et de développement international. C’est aussi celui qui travaille avec les pays en développement, parmi eux ceux d’Afrique. Ce secteur œuvre avec ces derniers sur les questions africaines de réduction et de fin de pauvreté. L’intérêt d’avoir l’associatif dans le modèle de transition économique va de soi. Si l’on veut continuer à réduire la pauvreté à l’intérieur comme à l’extérieur du bloc économique, alors cette tâche de réduction de la pauvreté doit être aussi inscrite parmi les priorités du nouveau modèle de transition économique. Ceci concerne aussi bien le modèle au niveau du bloc qu’à celui de l’économie sortante, de même qu’à celui des organisations associatives. S’agissant du modèle de transition s’appliquant à l’économie associative, la transition doit être présente dans le modèle de fonctionnement des économies associatives. C’est pourquoi, au niveau de CENFACS, nous nous sommes engagés à réfléchir sur les effets de la transition économique entre l’Union Européenne et le Royaume Uni sur nous. Nous le faisons malgré le fait que de part et d’autre, ils évitent de parler de la transition économique alors qu’en réalité ce qui se passe entre les deux camps c’est la transition économique. Pour des raisons évoquées ci-haut, l’inclusion de l’associatif dans le modèle de transition économique paraît nécessaire sinon indispensable si l’on veut préserver les acquis et rechercher des solutions nouvelles en matière de réduction et de fin de pauvreté. A number of Africa-based Sister Organisations (ASOs) do not think that the transition of the economies of regional economic bloc such the European Union and the exiting UK will have a significant impact on them. They also trust that CENFACS will continue to work with them on poverty relief even if there are some changes. They strongly believe that the EU and UK will be still attached to the value of international development and work on poverty and humanitarian relief during and after the transition. The above are just the preliminary findings of how ASOs perceive transitional economies of the EU and UK. A full survey on the opinions of ASOs may be required to provide a more or less rational argument based on qualitative and quantitative data and research on their real perception about the transition of the economies of EU and UK if it happens. As part of an investigation on the effects that economic transition of Regional Economic Integration (expressed by the UK leaving the European Union) could have on the work of Africa-based Sister Organisations, CENFACS would like to collect your views. The aim of the survey is to assess or appraise the extent to which economic transition of both the REI (here EU) and the leaving country (e.g. UK) can affect the performance and the economy of the non-governmental, charitable, voluntary and community Africa-based organisations. If there is an effect, what are the size, magnitude and direction of this effect? To take part in this survey, please contact CENFACS. If you have already conducted your own survey, please let us know your results. Already in the Issue of FACS no. 55, we spoke about the skills needed in Post-REI (Post-Regional Economic Integration) times. We also touched on the issue of transitional volunteering. We promised to come on the issue of P-REI volunteering in Winter 2017/18 which we did. Our Winter e-discussion on Volunteering in the Post-REI (Regional Economic Integration) Era showed the need to rethink the role and the skills we need for our current and future volunteers. The discussion was an opportunity to exchange ideas on skills auditing and reappraisal, adapting capacities and the areas of training that our All in Development Volunteers may need in order to deal with our work during the transitional economy. If you have anything to add to our work or need further details about it, contact CENFACS. When exiting a regional economic bloc, there could be mixed reactions and effects in all areas and directions of life, including in the life of small and medium-sized organisations from both sides of exit. Some organisations may have the capacity to rapidly adjust to the new transitional situation. Others may find it difficult to cope with the new life. Already small and medium-sized organisations are stretched out from the financial point of view. A financial companion to smooth financial pain for those organisations in financial need may be required as it can help reduce uncertainty and create the climate of confidence. A financial companion may also be needed for Africa-based Sister Organisations (ASOs) if transitional economy may affect them. They may need financial support to continue to achieve their mission and objectives. Put it simply, a financial companion may help to answer two basic questions: what and why? The financial companion could be a financial transitional programme to accompany small and medium-sized organisations (SMOs) and ASOs throughout the period of economic transition. The programme can include a mixed funding package of financial products and services such as grants, concessionary loans, income generation schemes, online fundraising, bonds and shares, financial advice and advocacy etc. They are the organisations working closely with poor people on the ground etc. Both the type of financial accompany they need and the reasons for their need make sense to think of a financial support or companion to be on the side of SMOs and ASOs in order to reduce any adverse impacts of the economic transition that may occur when a country is exiting any given regional economic bloc. As it is titled this project is about integrating economic transition into CENFACS’ Programmes which may be affected by the economic transition. It is a project designed to help reduce the adverse impact of economic transition, if there will be any, on CENFACS and CENFACS project and programmes beneficiaries. Through this project we will develop way of working that takes into account the contents of the economic transition and also take actions to correct any potential harmful effects that may result from the transition while using any good opportunities that may arise from economic transition to strengthen our work on poverty reduction. The length of this integration will be determined by the nature, length and influence of the economic transition on CENFACS and its project and programme beneficiaries. To support and or find out more, please contact CENFACS. For a full copy of the 58th Issue, please contact CENFACS.